Oftentimes, when things seem to be hard to understand and our minds cannot comprehend the meaning of the things, events, and people around us we can easily turn our backs and go back to our former lives. This is so in our spiritual life. When we cannot anymore reach the meaning of the things around us and when our relationship with the Lord seems to be dry, we give up. This is why our readings this Sunday challenge us to choose wisely. In the 1st Reading, Joshua asks the people of Israel to choose, whether they will serve God or to follow other goods. But for Joshua and his household, they chose to serve God for he knows that everything that has happened in his life and that of his family was God’s will. In our Gospel, Jesus plainly reveals Himself to those who followed Him, that He is the food of everlasting life, but in order to be able to receive this life they have to partake of His Body and Blood. With these words, the people stopped following Him. Then, Jesus turns to those whom he chose and He said to them, “Are you going to leave me also?” How painful this could be for the Lord, people left Him because they did not want to make Him part of their lives. They did not want to relate with Him. What, then, is our attitude when we are asked to be part of Jesus’s life? 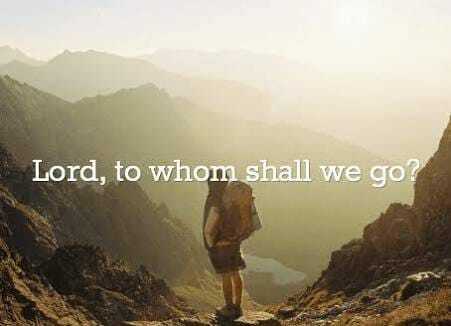 Are we ready to follow Peter and say “to whom shall we go?” or just live and go back to what we were before. Choose wisely, for your life’s future is at stake.